Each of the following news reports does not provide a crucial piece of information, but simply assumes it. Can you spot what’s missing? So what’s missing? Every one of these reports omitted an explanation of why grunts and ‘ape noises’ from spectators, or referring to radio station managers as ‘monkeys’, is considered racist. The closest anyone got to hinting that there is something unspoken underlying such ‘racism’ were the comments from the barrister that ‘anyone with common sense knows that monkey noises are evidence of racial abuse’ and from the radio station manager asking incredulously whether Jason Akermanis knows the full meaning of the word ‘monkeys’. Given his protestations of innocence, apparently Jason Akermanis didn’t know. And who could blame him, since no-one was courageous enough to explain it publicly? Making a monkey out of people—racist or funny? Although mocking of Bush and Darwin in such a way is considered humorous or disrespectful (depending on the leanings of the viewer), I’ve never heard it described as ‘racist’. And herein lies the key—when white people are likened to monkeys and apes, it’s not racist, but to equate black people with monkeys and apes is racist. To discover why, we can look to Darwin himself. It was his ideas that led to him being mockingly drawn as an ape—it seems he was the first man ever to be thus portrayed—and it is his ideas which fuel ‘monkey’ jibes towards black people today, and explain why such jibes are considered ‘racist’. 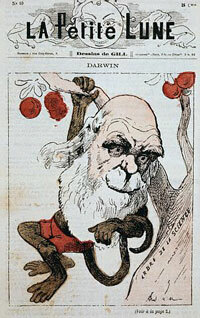 Thus the beguiling popular drawings showing an evolutionary transition from dark monkey/ape to white human became increasingly the popular perception/view. So today, because evolution is presumed to be true, making monkey noises at a black person is construed as ‘racist’, i.e. demeaning black people relative to whites. In other words, when the media reports that monkey innuendoes are racist, they’re accepting a deep-seated evolutionary worldview that some people groups are less evolved than others—specifically, blacks are less evolved than whites. Of course they don’t dare put it so bluntly—it’s simply assumed. And now the authorities are trying to stamp out such innuendoes.13 This is a classic example of society reaping the consequences (e.g. racism) of what it has sown (evolutionary teaching). Many in authority, it seems, have accepted (if not overtly promoted) the teaching of an evolutionary worldview, yet are unwilling to accept its consequences. This is a classic example of society reaping the consequences (e.g. racism) of what it has sown (evolutionary teaching). The solution, of course, is to return to a biblical worldview—the only effective answer to racism16—pointing out a few undeniable realities of life along the way. For example, it is people, made in God’s image, who become professional footballers, and paratroopers, and managers of radio stations. Monkeys never have, and never will. BBC Sport, FIFA probes Spanish racist chants, 28 April 2005. Return to text. 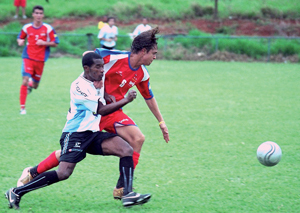 Richburg, K., Fans’ racist taunts rattle European soccer, Washington Post, 29 April 2005. Return to text. Dodd, V., Monkey chants as black man died ‘not racist’, The 1990 Trust—Human Rights for Race Equality, <www.blink.org.uk/pdescription.asp?key=1010&grp=2&cat =10>, 29 April 2005. Return to text. ABC News Online, Call for Lions to sack Akermanis over radio gaffe, 28 April 2005. Return to text. ABC Sport, Aka axed over ‘monkeys’ race row, 28 April 2005. Return to text. Pingree, G., The ugly game, TIME (Europe), 17 May 2005. Return to text. An additional comment from Claude Moraes, a UK member of the European Parliament, reflects just how widespread such ‘racist’ behaviour has become: ‘The most horrifying thing was that middle class, professional people, families and young people were involved and they felt it was normal.’ FIFA.com—the official website of the Fédération Internationale de Football Association, Calls for tougher action over racism at UEFA conference, <www.fifa.com/en/fairplay/index/0,1255,114249,00.html?articleid =114249>, 5 May 2006. Return to text. George W. Bush or Chimpanzee?, 17 May 2005. Return to text. Political humor newsletter, 17 May 2005. Return to text. The Guardian’s Sarah Crown, reporting on a 2006 speech entitled ‘Why creationism is wrong and evolution is right’, by well-known outspoken proponent of evolution, biologist Steve Jones, wrote that Jones gained the audience’s sympathy ‘with a few well-aimed gags at the creationists’ expense’, including: ‘I’m not sure why Americans deny the truth of evolution, when the evidence [Jones gestures to a slide of pictures of George Bush juxtaposed with photographs of apes on the screen behind him] is all around them … ’. 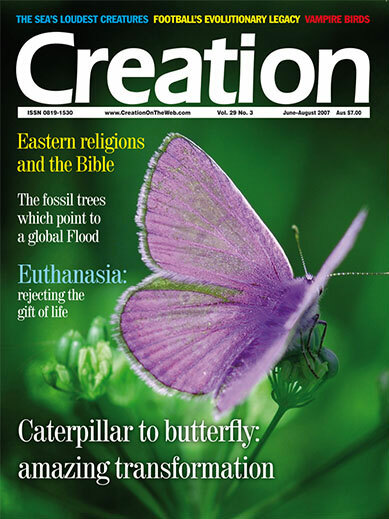 Crown, S., Why Creationism is wrong, The Guardian, 5 June 2006. Return to text. 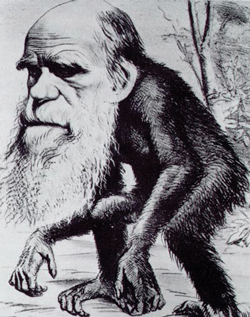 Browne, J., Darwin in caricature: a study in the popularisation and dissemination of evolution, Proceedings of the American Philosophical Society 145(4):496–509, 2001. Return to text. Williams, G., ‘A Civic Biology’ and eugenics, Journal of Creation 20(3): 123–127, 2006. Return to text. United Nations General Assembly, 58th session, Item 117(a)—Elimination of racism and racial discrimination, <www.hri.ca/fortherecord2003/documentation/genassembly/a-58-313.htm>, 5 May 2006. Return to text. Associated Press, UEFA urges tougher action against racism—Punishments by next season to combat persistent taunting at games, 5 May 2006. Return to text. BBC Sport, Society has to change—Barnes, 5 May 2006. Return to text. Wieland, C. One Human Family: The Bible, science, race and culture, Creation Book Publishers, Georgia, USA, 2011. Return to text.